The ANC formally nominated Cyril Ramaphosa and Nkosazana Dlamini Zuma as the only candidates to run for the presidency of the party. JOHANNESBURG - After much toing and froing late on Sunday, over 4,700 ANC delegates have started voting for the party's top six leadership. It was initially expected that voting at the party's 54th National Conference would get underway at 10pm, before officials informed the media that the process had been postponed until Monday morning. However, just after midnight, the party confirmed that voting had begun. Voting is expected to take at least six hours, stretching into morning. The ANC's elective conference has been plagued by setbacks, with many items on the programme of events running up to 24 hours late. 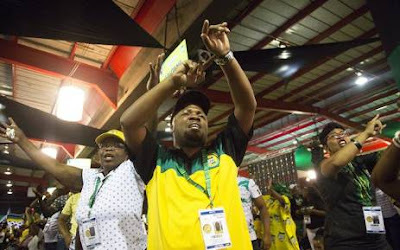 Earlier on Sunday evening, the party formally nominated Deputy President Cyril Ramaphosa and former Cabinet minister Nkosazana Dlamini Zuma as the only candidates to run for the presidency of the party. In a surprise move, Mkhize the withdrew his nomination for deputy president while Nomvula Mokonyane also declined to stand for the position of treasurer. The options for national chairperson are Gwede Mantashe and Nathi Mthethwa. The fight for secretary-general is between Senzo Mchunu and Ace Magashule. The choice for deputy secretary general is between Jessie Duarte and Zingiswa Losi. Candidates for treasurer general are Paul Mashatile and Maite Nkoana-Mashabane (275). At the same time, Eastern Cape ANC chair Oscar Mabuyane has told Eyewitness News that the province had decided to throw its weight behind Sisulu's bid to become the deputy president of the party. Mabuyane also says they approached Mkhize as he was their initial candidate for deputy president, but he did not receive the desired number of nominations and the gender issue could not be ignored. He says they engaged Mkhize on Sunday morning and came to an agreement that he would withdraw his candidacy for the deputy president position. Mabuyane praised the outgoing treasure general for being a disciplined and mature cadre and for showing that the contest is not about an individual, but about the good of the party.